Since the first phase opened in late 2014, the Mississauga Transitway has created a better way to travel across the city on MiWay. This fall will mark the completion of the 18-kilometre, 12 station bus-only corridor, with the opening of Renforth station. The transitway makes commuting through Mississauga faster and easier for thousands of riders every day. With the transitway, there are no traffic lights, fewer construction hold-ups, and dedicated bus lanes that let you escape the madness of rush hour traffic. 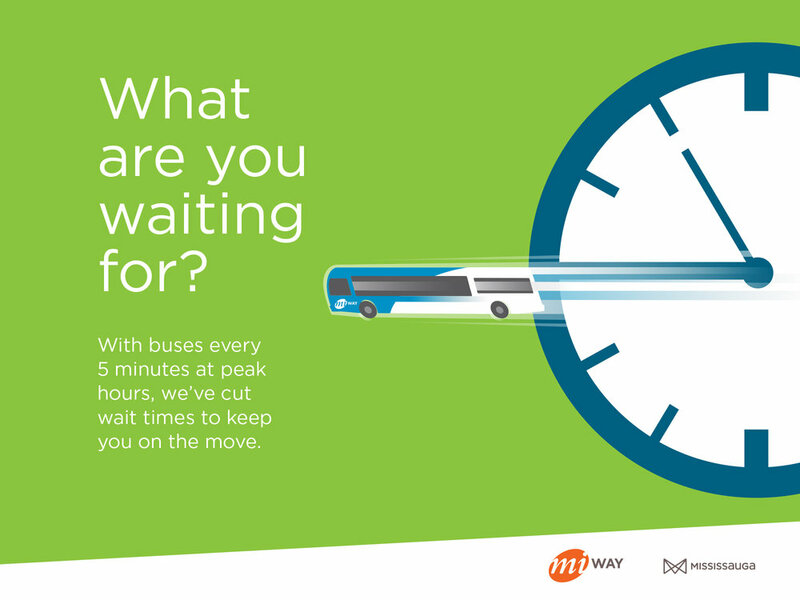 Spend less time waiting and more time on the move with frequent buses every 5 minutes at peak hours. You can stay on track with real-time bus updates and route and stop schedules on our trip planner. If it’s hard to find parking, we’ve got a spot for you. Park your car for free at the following four stations: Winston Churchill, Erin Mills, Cawthra, and Dixie. You can also lock up your bicycle at any station, or bring it along with bus bike racks on every MiWay bus. All the modern stations of the Mississauga Transitway have Wi-Fi and heated enclosures to make your trip a comfortable one. Washrooms are available at City Centre Transit Terminal and Renforth station (opening fall 2017). The stations are accessible and stations from City Centre Transit Terminal to Renforth have electronic signage with real-time bus information. You can also enjoy the public art project “Building Colour” by local artist Panya Clark Espinal at seven stations. The art simulates a work site, with bronze sculptures of tools and equipment, as well as architectural glass and touch-activated, colour changing LED lights. The Mississauga Transitway is your connection to the GTA. Transfer to other transit systems, such as TTC, GO Transit, and Brampton Transit. Got a flight to catch? The transitway is your gateway to the Toronto Pearson International Airport. To get there, take MiExpress route 107 between City Centre Transit Terminal and the LINK train at Viscount Station. Finally, when you’re not stuck behind the wheel in traffic, you can find new time for yourself. On the transitway, you can read your favourite book, or listen to your favourite music or podcast. You can get more work done, or even catch up on sleep. So, what are you waiting for? Try the Mississauga Transitway today!